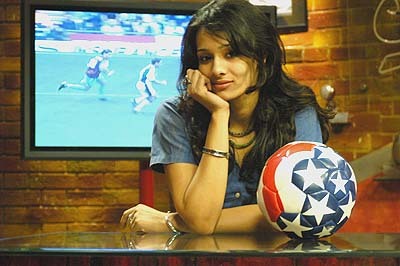 juslyktht: Mayanti Langer Is Not Just An Eye-Candy, On The Pre-Show Of FIFA Football World Cup . Mayanti Langer the host on the pre-show of FIFA football world cup, is not just an eye-candy. She is beautiful and elegant, no doubt, but not dumb like Mandira Bedi. I googled her and discovered that she was in her college football team. Also from watching her hosting a football show, it is evident that she knows the game.